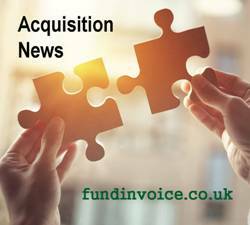 News just in, Henry Howard Cashflow Finance, the Newport based invoice finance company, has been acquired today by Advantedge Commercial Finance (formerly Factor 21). Apparently Henry Howard Finance Group have decided to exit the invoice finance and factoring market space to refocus on their asset and vendor finance products, leaving an acquisition opportunity for Advantedge. The current total count on my list of distinct UK invoice finance organisations is 93 (at the time of writing). For more general information about these services please see our Guide to Invoice Financing.